I’ve been tracking the progress of Nomiku, a consumer class immersion circulator that was the highest grossing food project on Kickstarter and a Haxlr8r success story. 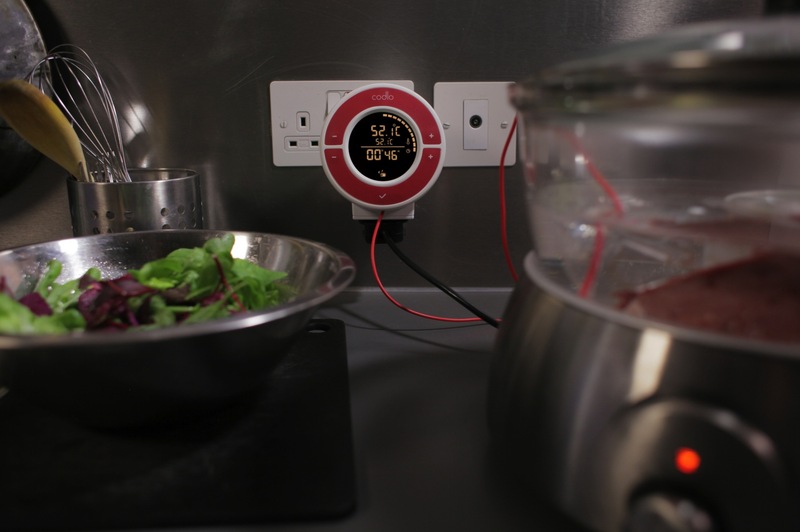 The product aims to bring to fancy restaurant technology into the home kitchen with a device that clips onto a pot of water to heat it to precise temperatures, allowing you to cook meat sous vide. The technique of slow cooking meat in a vacuum sealed bag is de rigueur at high-end restaurants, but out of reach for home users because of the price. While it hasn’t started shipping yet, Nomiku will retail for $359 and the creators call it the first immersion circulator for the home cook. But look out Nomiku. Here’s comes the second sous vide device for the home cook: Codlo, a startup product from a small team with a strikingly similar story to the Nomiku folks. And it costs 50 percent less. Nomiku is further along in production than Codlo. The $150 Codl0 is stil raising funds on Kickstarter. Nest thermostat) plugs into the wall and a long temperature probe runs from the device into the slow cooker. Is there room for more than one home use immersion circulators? It will be interesting to see how home cooks take to these gadgets and whether we see more competition in this space.